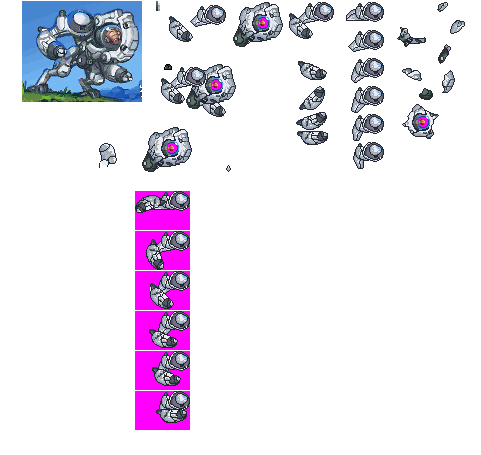 Is anyone willing to script these techion brain mech sprites into an actor? It does require time to make bigger actors which you can't simply make by copy/pasting some template, since they have much bigger limbs and would require some special finetuning. Though, the real problem and probably the only reason why I think very little people would pick up this request would be because of the walk-paths. They aren't very easy to do (I know few people that have made their own and actually know how they work), specially for a mech with such weird legs and it's "leaning forward" stance. Just putting it out to let you know that sometimes mods are harder to pull than it seem, specially when it comes to actors that are bigger or different than the usual ones. Nevermind they're not even finished. The body, arms, and some gibs are done, but the legs are not.